What do you think of when you think of the perfect All American summer day? In our family, we think of days at the beach, baseball games, eating fresh watermelon, catching lightning bugs and of course, grilling out with friends and loved ones. Some of my most cherished childhood memories include summers at our family cottage in northern Michigan, where my grandfather would take over the grill for the entire extended family, and we would all eat on the deck together, telling stories and laughing and pigging out on ribs, chicken and Grandma’s potato salad. The kids would always be covered in sticky barbecue sauce, which usually led to a nighttime dip in the lake to clean off, followed by ghost stories and family sing alongs around the campfire on the beach. 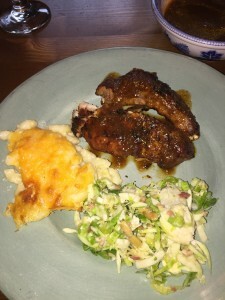 This traditional recipe with a twist reminds me of those times, and after you make these delicious ribs, hopefully they will remind you of some of your own favorite summer memories. 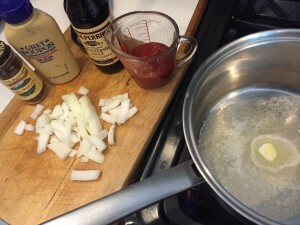 This recipe was adapted a few years ago from an article I read about making your own barbecue sauce, which I had always wanted to try. While there are some super delicious bottled sauces available on the market, this homemade sauce is easy and tasty, and it uses ingredients you probably already have at home. The sauce is sweet and sticky and delicious – it’s even great as a dip for potato chips or fries the next day. I put it on a chicken quesadilla for my son one day, and he devoured it, but he loves Coca-Cola, so I wasn’t surprised! As you can see from the photo above, most all of the ingredients are probably already in your house right now. Taking these everyday ingredients and simmering them into a delicious sauce and then blending it to perfection is well worth the effort! Who knew that soda and ketchup and a few other ingredients could turn into something so yummy? 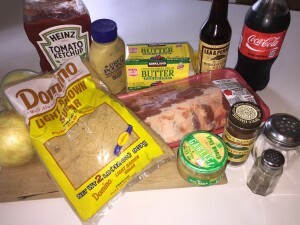 Before you start the Coca Cola concoction (it’s kind of like making up your own recipe when you were a kid – but this one actually tastes good), you need to prepare the ribs. I cut my slabs of ribs into pieces of 4 or 5 bones so they cook quicker and more evenly. I also season mine with chili powder, salt and pepper before placing them in a large pot with chopped onions, a can of Coke, some chopped garlic and enough water to cover the ribs. You want to simmer these ribs for about an hour after bringing the liquid to a boil. Once they are done, you can remove the ribs from the liquid and set aside to cool for a couple of hours until you are ready to throw these bad boys on the grill. This is great because you can cook them in the morning and then go off and enjoy your day before hosting your Barbecue in the evening! Before you head off to the beach or the pool or the baseball game, thought, make your sauce while the ribs are boiling. After melting some butter in a pan, add your chopped onions, ketchup, Coca Cola and spices and bring it to a boil and then let it simmer on low for about 25 minutes. The sauce will thicken up, and smell amazing too! Take it off the heat and let cool, then pour into a blender and mix it up, then pour it back into a pan and set it aside until grilling time. Once you are ready to throw the ribs on the medium hot grill, make sure you have your sauce nearby to coat the ribs while they are finishing on the grill. 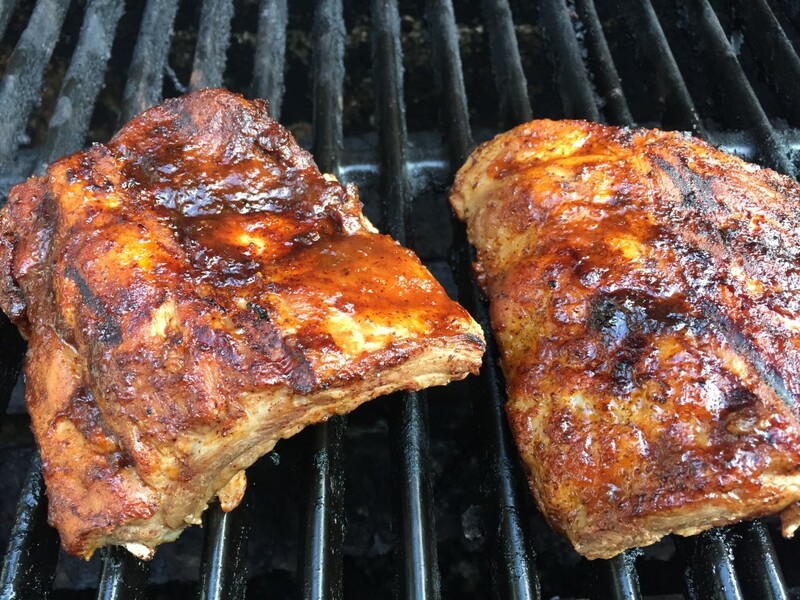 I like to add a quick rub of chili powder, brown sugar and garlic salt on the cooked and cooled ribs before placing them on the grill to give them a nice crust. 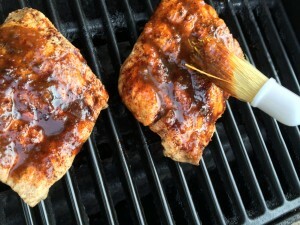 As they are cooking on the grill, brush a generous amount of sauce on them before turning them over and doing it again. I even like to do it again, just because I like saucy ribs like my Grandpa’s. Serve immediately after grilling, with lots of napkins and possibly a pool or a lake nearby. 1. 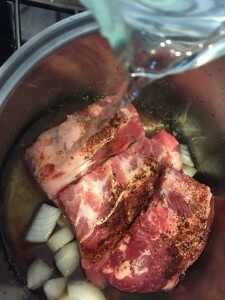 Mix 1 T. chili powder and salt and pepper in a small bowl and rub onto rib sections, then place ribs in a large pot and cover with can of Coca Cola, half of your chopped onions, minced garlic, and enough water to cover the ribs. Bring to a boil and then turn down to low heat and simmer for about an hour. Remove from heat and take out ribs with tongs and set them on a platter to cool completely. 2. While your ribs are cooking, make your sauce in a medium saucepan by melting 2 T. butter and then placing your remaining chopped onions in the pan. After they get soft (about 5 mins. ), add 1 T. chili powder, 1 liter Coca Cola, ketchup, dijon mustard, brown sugar, salt and pepper. Bring to a boil over medium heat, then lower your heat and simmer until the sauce thickens up, which is about 20-25 minutes. Remove from heat and let the sauce cool before pouring it into a blender and blending for 30 seconds. Pour the sauce back into the pan and set aside until you are ready to use it. 3. When you are ready to grill the ribs, heat your grill to medium high heat and rub the remaining chili powder mixed with garlic salt and 2 T. brown sugar over the ribs for an extra crust. Place the ribs on the prepared grill (sprayed with cooking spray or rubbed with olive oil) and brush with the Coca Cola sauce, turning and repeating a few times for about 10 minutes. Your ribs will be crispy and saucy and delicious. You might get a little messy, but it’s summertime, so plan jump in the water or run through the sprinkler after a little while. Enjoy! How do you like your BBQ ribs? Jennifer McKinney is a mom, a teacher, a writer, a cook, and a perfectly imperfect hostess. When she is not at the baseball or soccer fields or the dance studio, she is usually in a kitchen experimenting with new recipes, curled up on her couch reading a good book, hitting the slopes, spending time with friends and family, or escaping up to Northern Michigan. She has been know to host an impromptu dance party or two, and she adores her three teenage children more than they will ever know. Jennifer’s done it again! Be assured her ribs will be on our menu one night this week. Since I’m close to being a contemporary of her grandfather’s, I can tell her recipe will allow me to recreate the ribs I loved as a child. You make this so delicious, I will try it in my party this weekend. Thank you so much for sharing this ! I have been dying for the weather to get nice enough to grill again, and this is the first recipe I am trying. This is so easy to follow, and sounds absolutely amazing! The pictures paired with the description made this effortless to follow, which I loved. I think, for me, the pictures really made all of the difference. I think they were pictures of the right images, and they were perfectly placed so that they didn’t seem random or useless. I definitely give this a thumbs up, and I am so excited to try!